MLK was staying at the Lorraine Hotel in Memphis, Tennessee. The motel was known as a haven for African-Americans (many hotels were for whites only) and King had stayed at the hotel on numerous occasions. King stayed in room 306, where our drama takes place. He was assassinated on the balcony at 6:01pm and was pronounced dead at St. Joseph’s Hospital at 7:05pm. Room 306 was never rented out again and the Hotel is now the National Civil Rights Museum. 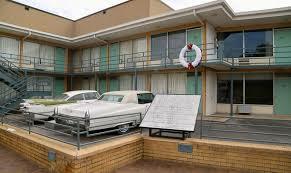 King was assassinated the morning after delivering his speech, “The Mountaintop” at the Mason Temple in Memphis. King almost did not deliver the speech because he was not feeling well that evening but he was convinced to go as the crowds at the church would not accept any replacement. The iconic photo of Dr. Martin Luther King Jr. standing on the balcony with his friends is burned into American's collective memory. It depicts King with three of his trusted companions. Jesse Jackson is among them. Jesse Jackson was well-known at the time for being a leader of the civil rights movement. Like King, he was also a minister. In the years after King’s assassination, he founded Operation PUSH and the National Rainbow Coalition, organizations created to advocate for African-American self-help and would go on to run for president twice. In 2000, President Clinton awarded him the Presidential Medal of Freedom. Also depicted in the photo of King on the balcony the day before his death is Hosea Williams. Williams was arrested 125 times for his militant acts of defiance while working in service to the civil rights movement. Perhaps his passion for civil rights was a direct consequence of his having been beaten so severely he was hospitalized for five weeks because he had a drink at a "whites-only" bar. Not as well known as King or Jackson, Williams nevertheless was a major figure in the civil rights movement with several triumphs to his credit. Because of his efforts, Savannah, Georgia, was the first city to ban "whites-only" lunch counters. He also led a march against the Klu Klux Klan in 1987 and won a $950,000 jury award after suing Forsyth County. He later became a senator and died of cancer in 2000. The third person on the balcony in the photo is Ralph Abernathy. Also a minister, Abernathy, along with King, was a key leader in the act of civil disobedience in 1955 to 1956 when he arranged a boycott of the bus company instigated by Rosa Parks' act of civil disobedience. Robert Kennedy once accused Abernathy, a member of a activist group called The Freedom Riders, of embarrassing the United States in the eyes of the world. Abernathy responded "Well, doesn't the Attorney General know we've been embarrassed all our lives?" Abernathy took over the Southern Christian Leadership Conference Poor People's Campaign and organized and led the March on Washington in 1968. He died in 1990. Andrew Young, an activist who later served as executive director of the SCLC, was present with King as documented by several photos taken in King's motel room by "Life" photographer Henry Groskinsky. Also traveling with King on that fateful trip was his longtime friend and the only white civil rights activist in the entourage, William D. Campbell. Finally, there was Ben Branch, known as the "pied piper" of the civil rights Movement because he was the musician who accompanied King on his travels. He was the last person to whom King spoke when he said, "Ben, don`t forget, I want you to play 'Take My Hand, Precious Lord' tonight like you've never played before. Play it for me. Play it real pretty." A few minutes later, King was struck down by an assassin's bullet. James Earl Ray was charged with the murder and later pleaded guilty. MLK was assassinated by James Earl Ray who was captured after an international manhunt. In 1969 he pled guilty but he quickly took back that “confession of guilt” and denied involvement in the murder. Ray claimed he was set up and even some of MLK’s children and wife believe that Ray was either not the assassin or was not alone in the planning of MLK’s assassination.